Husky - end of prod. New Minx - end of prod. 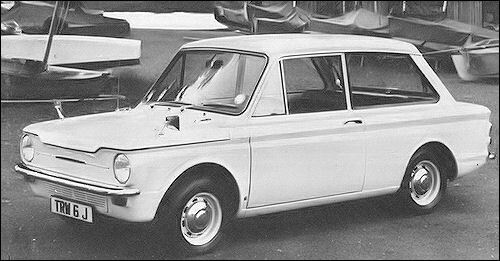 Under the Chrysler UK banner the popular rear-engined Hillman Imp is manufactured in three types, Standard, de Luxe, and Super but the basic powerunit for all three is the 875 c.c. light-alloy four-cylinder unit with overhead camshaft. The lively little engine is in fact derived from the 1100 c.c. Coventry-Climax racing unit of a few years ago, and it is produced at Chrysler's Scottish plant. 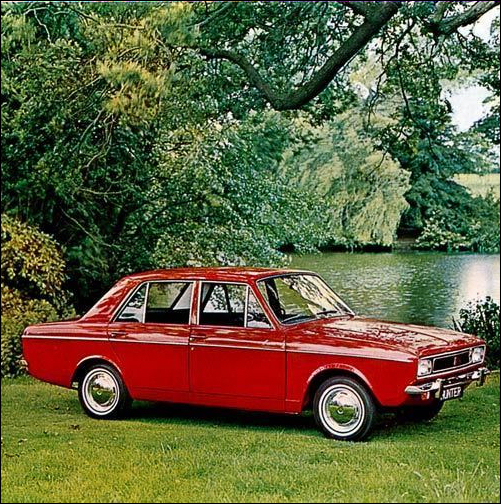 Although first introduced in May 1963 the Imp with its all-independent suspension, lift-up rear window and fold-flat rear seats, is still very much a modern small car. 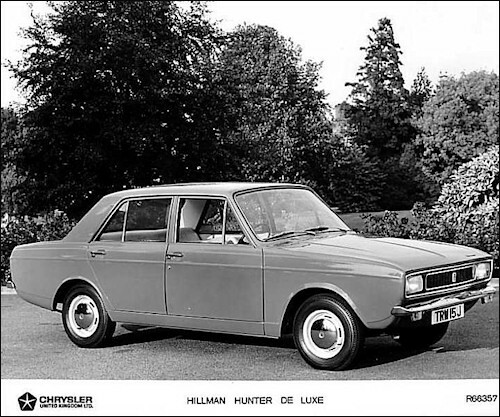 Hillman Hunters are revised for 1971, the Minx, Hunter, and Sunbeam Vogue being dropped in favour of Hunter de Luxe, Super, and Grand Luxe. 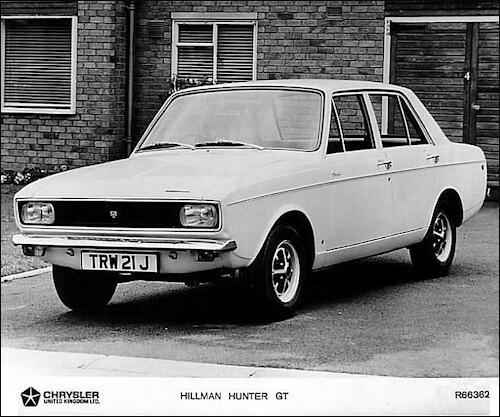 There is also a revised Hunter GT. The Hunter de Luxe is a 1500 c.c. saloon and is based on the former Minx, the Super has the 1725 c.c. 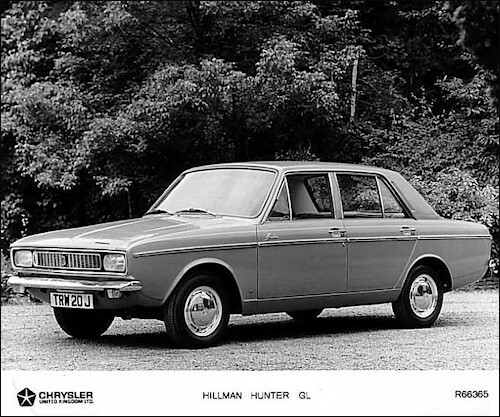 engine, and the most luxurious, the Hunter GL, has rectangular headlights, and a 77 b.h.p. version of the 1725 c.c. engine with aluminium cylinder head. The Hunter de Luxe is available with Borg-Warner automatic transmission, when a 1725 c.c, engine is fitted. 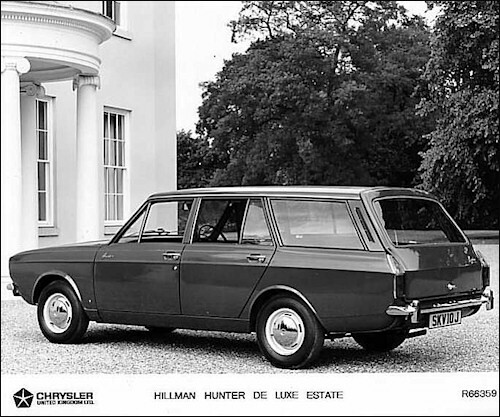 The revised Hunter estate cars come in de Luxe, and GL form, the latter model having similar body styling and interior trim to the Hunter GL Saloon. Both estates are full five-seaters with 34 cub. ft. of luggage space behind the rear seat. If the rear seat is folded down there is a vast 62 cub. ft. load platform. The de Luxe Estate has the 1500 c.c. engine as standard, but the 1725 unit is an optional extra. 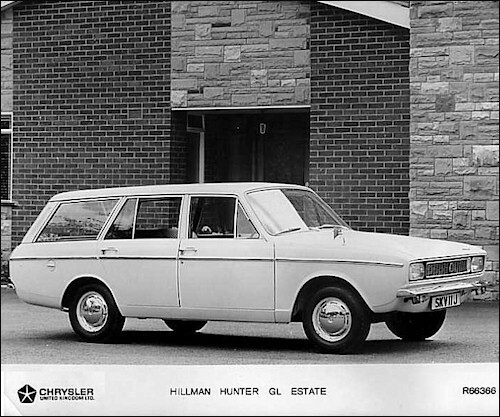 The GL Estate has the 1725 engine as standard, and both models have heavy-duty rear springs for weighty loads and cross-country work. This 100 m.p.h. 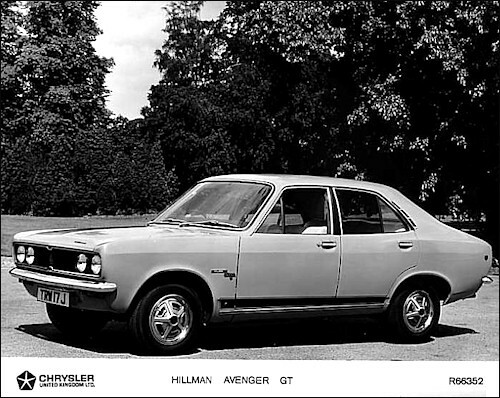 saloon is based on the model which won the London-Sydney Marathon two years ago. 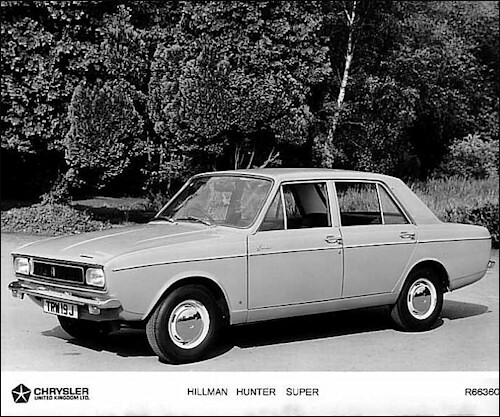 Previously named Hillman GT it now has a new name and numerous revisions, including a matt black rear body panel. The 79 b.h.p. 1725 c.c. engine is identical to the unit employed in the Sunbeam Rapier, and it can accelerate from zero to 60 m.p.h. in 11½ seconds. 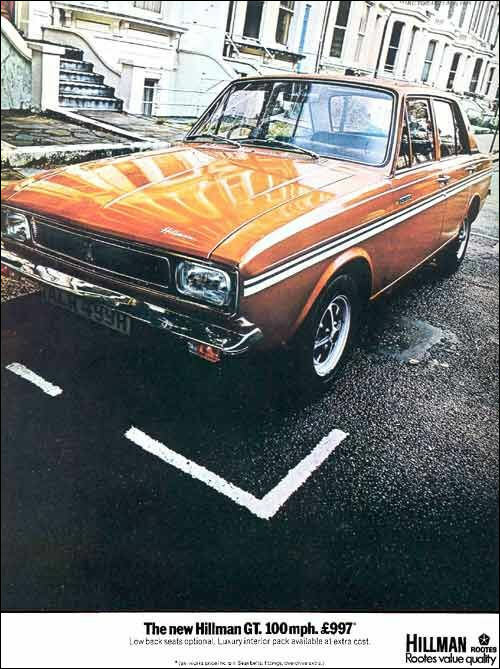 There are distinctive GT badges, a neat coach-line on the bodysides, and stiffened suspension and radial tyres are standard equipment. 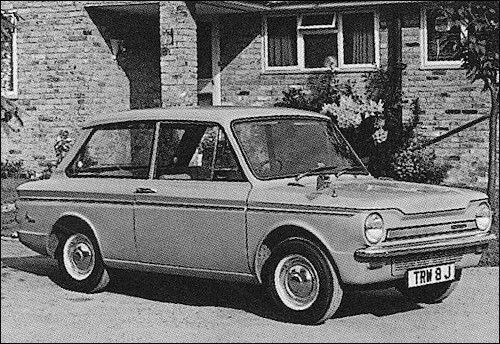 Although a sporting model, there are four doors and an 18 cub. ft. boot. 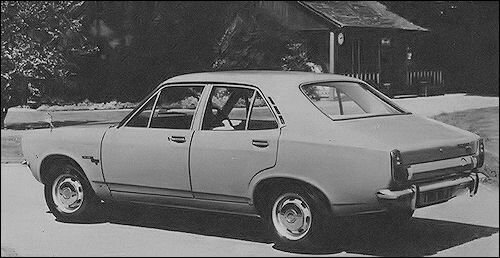 Chrysler UK's 'universal car', introduced last February, is a neat four-door saloon with Mac-Pherson strut independent front suspension and a 'live' rear axle. Both models are very competitively-priced and both are powered by a new five-bearing four-cylinder engine of 1248 c.c. in standard form, but a 1498 c.c. unit is an optional extra. The Avenger was designed to capture international sales and represents a total investment of some £35m by its manufacturers. With 'semifastback styling' and curved glass windows the Avenger has more internal space than its exterior dimensions would suggest. 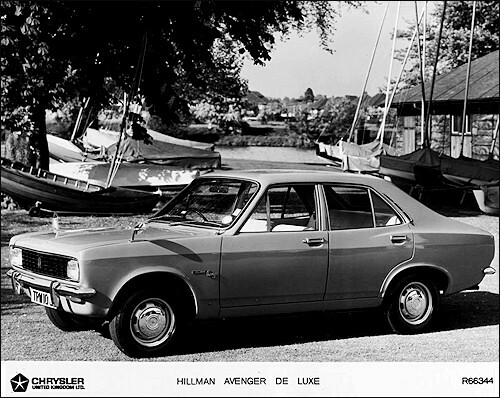 The 'Grand Luxe' version of the Avenger with 1498 c.c. engine as standard equipment, and four headlights in place of the two rectangular units of the de Luxe and Super models. The 'GL' also has luxury reclining seats as normal equipment, trimmed on the contact surfaces with woven nylon cloth which provides coolness in warm weather, and a comfortable temperature in winter-time. 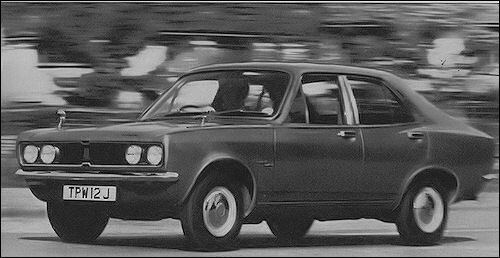 The facia too has special circular instruments in contrast to the less-expensive Avenger's 'strip-type' dash. All Avengers have front disc and rear drum brakes. 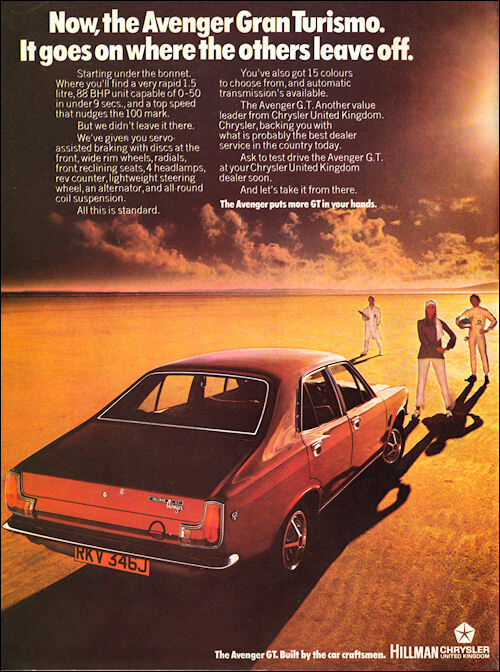 A new model from Chrysler United Kingdom, the Avenger GT is based on the Company's popular four-door saloon, but is powered by a specially-developed twin carburettor version of the 1500 Avenger engine. With 75 (DIN) horsepower, the GT has a 12 h.p. bonus over the Avenger GL, and radial-ply tyres are standard equipment for increased cornering power. Special wheel trims set the GT apart from other Avengers, and there is a rev-counter set into the attractively-styled facia. The exhaust system has twin down pipes for maximum efficiency.